Monique chose this recipe from the Weight Watchers magazine “Five Ingredient, Fifteen Minute recipes” and found on page 35, this is an amazing preparation. 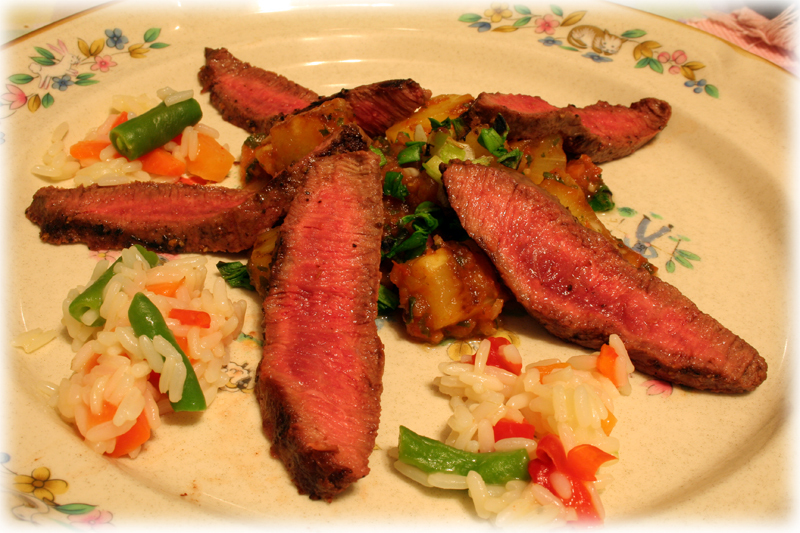 This was our first time cooking and eating flat iron steak, and I have to say it is a very good cut of beef. 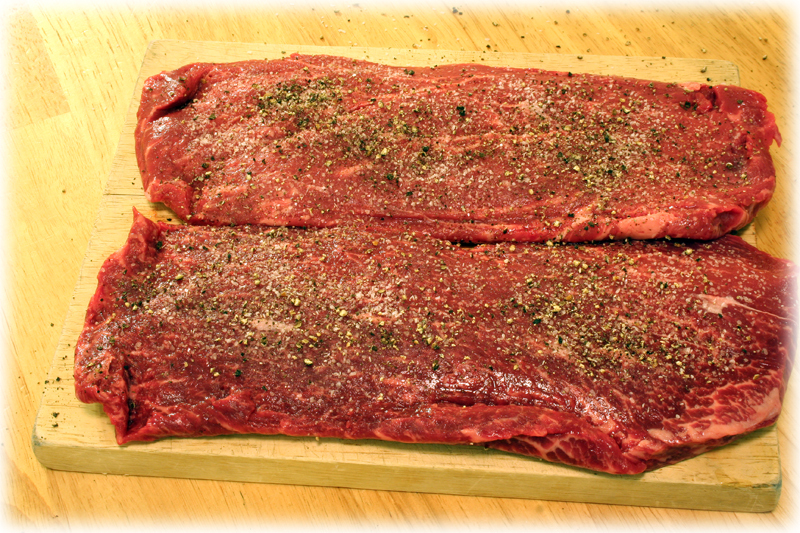 Similar in shape to flank steak, but a whole other texture and flavor, this flat iron steak is also an interesting cut. It is rated by the North American Meat Purveyors (NAMP) as the second tenderest cut of beef, ranked just under tenderloin. In addition, I have to concur with the NAMP; this is not only a very flavorful steak, but very tender and juicy when grilled to medium-well doneness. Back in the day, or around 1983 when I was taking the requisite butchering class at the apprenticeship there was no such cut of beef known as the flat iron steak. Of course, the section that the flat iron originates has always been there, it actually is derived from the #1114D Beef Shoulder, Top Blade Steak, as listed in the NAMP meat buyers. 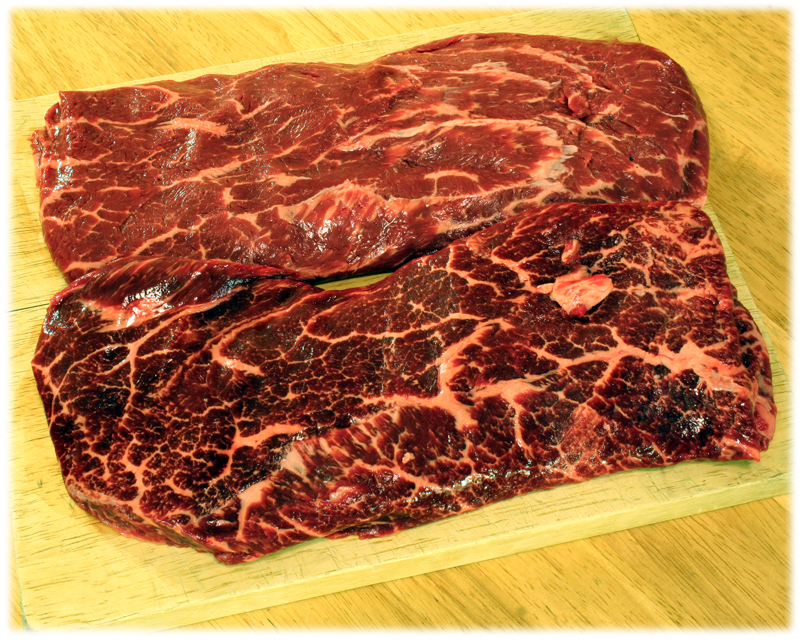 We first tired to find some of this flat iron steak at Super Target, after our inquiry, the meat guy said they do not carry it, but that the cut was developed by researchers at the University of Nebraska and the University of Florida. This piqued my curiosity to say the least. We did find some packaged flat iron steak at Lowe’s Supermarket and scooped up two one-pound average pieces of this very interesting cut. According to the Animal and Veterinary Sciences College of Agriculture, Meat Science and Processing Facility lab web site on Flat-Iron Steak, this cut of beef was developed with research funding by the National Cattleman’s Beef Association. 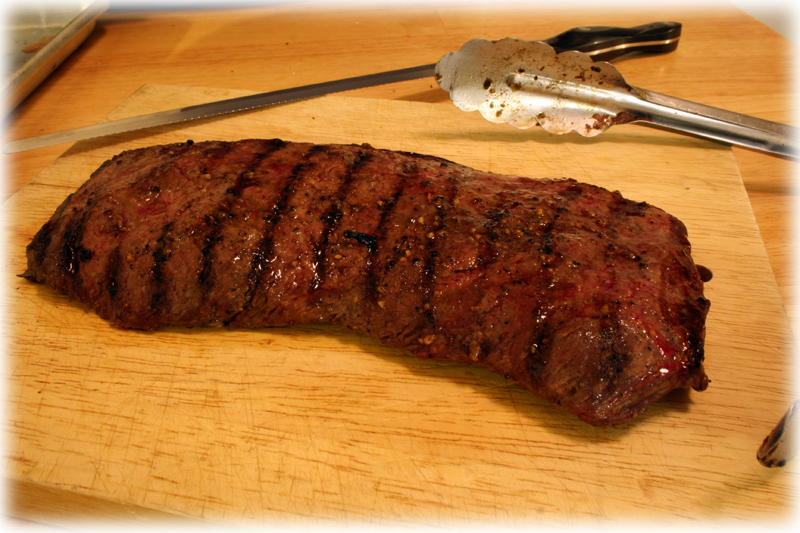 The link to the flat iron steak also will give you a short history on how it has come to been named “Flat Iron” steak. We modified this recipe by doubling the quantities so we could have some leftovers, and the only other change from the original is that we had some canned pineapple rings on hand and used those instead of fresh. 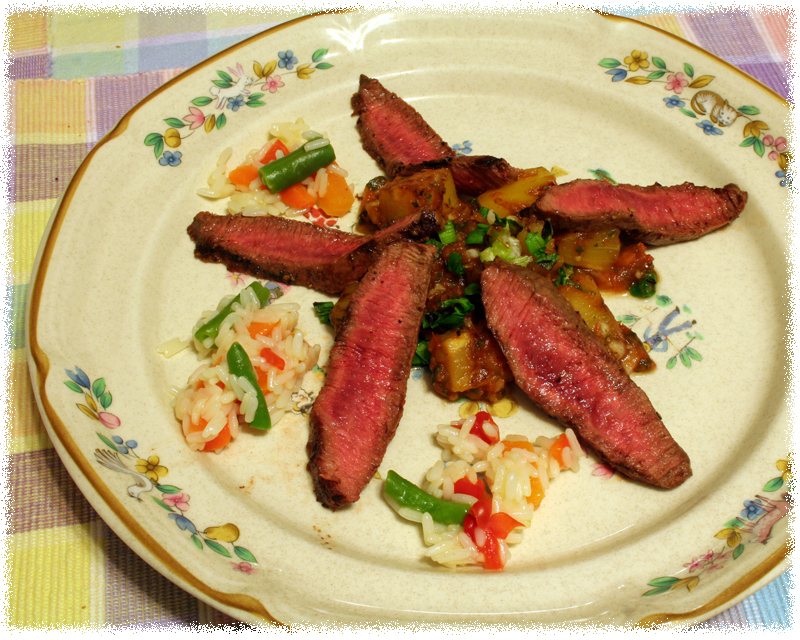 The original recipe has a Weight Watcher Points value of 5, each 1-pound flat iron steak yields 4 servings, or 3 ounces of cooked meat, and ¼ cup of the pineapple salsa. Calories 236, Fat 8.2g, Protein 24.4g, Carbohydrates 13.9g, Fiber 0.8g, Cholesterol 40mg, Sodium 287mg, Calcium 45mg. Click on these images below for a larger view. 2. Sprinkle pineapple chunks with the brown sugar. Sprinkle the steak with the salt and pepper on both sides. 3. Grill pineapple chunks on grill and cook on each side until browned and tender, or about 4 to 6 minutes. Combine the pineapple with the salsa and set aside. 4. Spray the grill with the cooking spray. 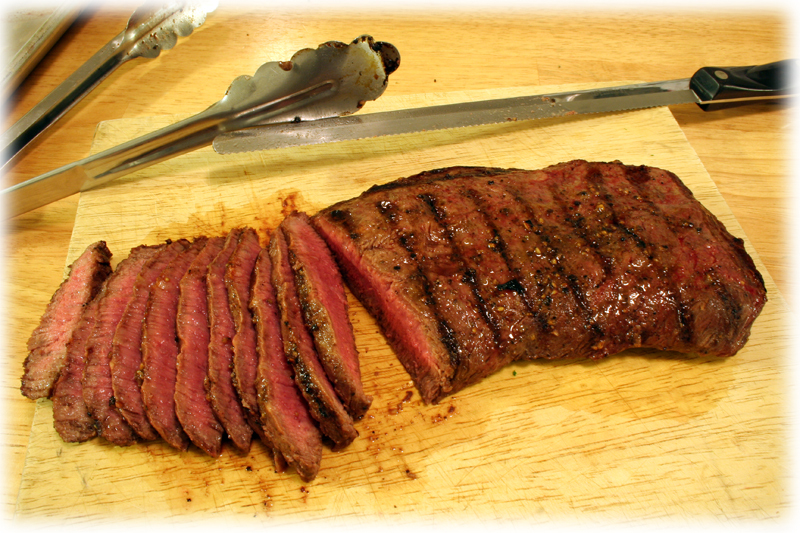 Grill the flat iron steak for 4 minutes per side or to desired doneness. Four minutes will be just at around medium-rare, depending on the grill heat. Add the green onions and grill for just a few minutes on each side. Chop the green onions and add them to the salsa. 5. 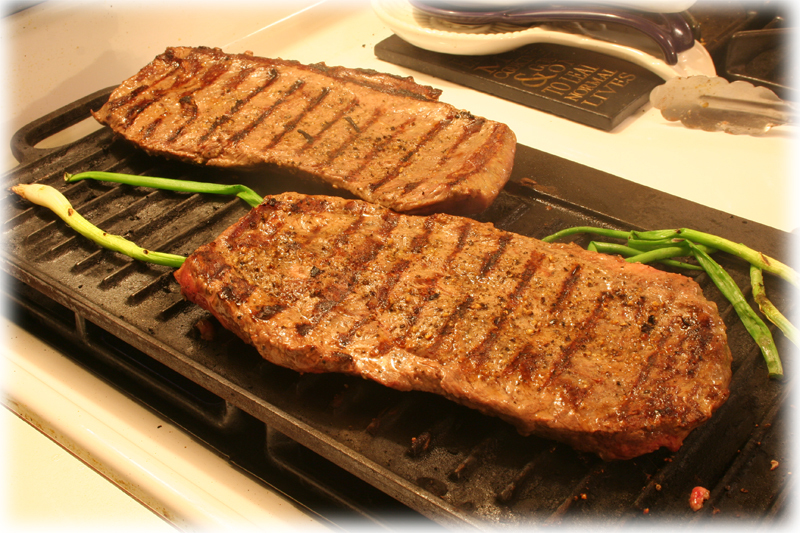 Remove the steak from the grill and allow it to rest for at least 5 minutes. Slice the steak against the grain in thin pieces. Serve with the pineapple salsa. Okay- so you were my hero before this recipe, but now you’re like mega-super-hero. This is awesome. I bet it is just so delicious! Can I use the George Foreman Inside Grill instead of the outside grill? Yes, the meat is a bit on the rare to medium-rare side, but I like it that way. Just have to grill it a bit longer for more doneness. Sure, the Foreman would do fine, but the cooking time might be a bit longer. Of course, the Foreman grills do have heat on top and bottom, but they do not seem to get as hot as a regular grill. Just have to watch the timing. Our model is quite old and we do not use it anymore, the newer ones may heat better, in any case, you should be able to grill with the Foreman. Love the pineapple salsa idea! I absolutely love your blog! This recipe sounds fabulous. Interesting info about this cut of meat. Who knew?! You know, I don’t think I’ve ever tried flat iron steak! It sounds wonderful though, and I love the sound of this simple and healthy preparation. love the salsa very nice dish! I am moving at the end of next month and I will be in a place that I can use my BBQ again. I can’t hardly wait, so I can try recipes like this. 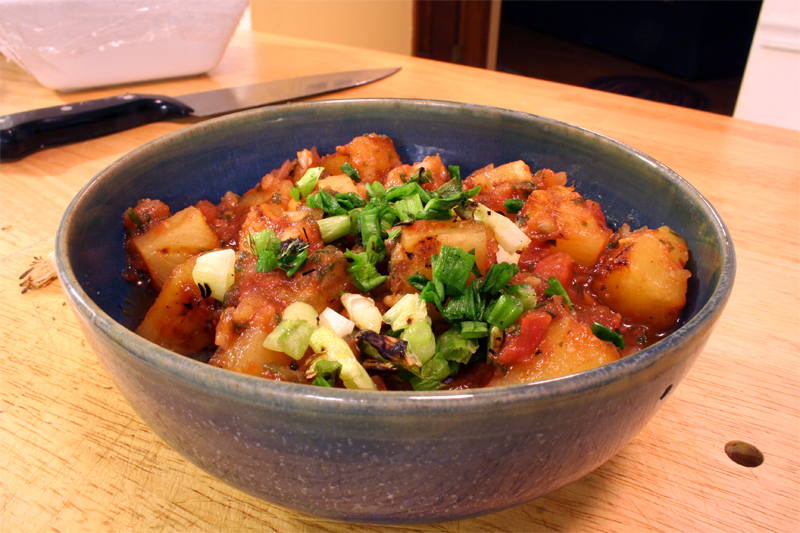 The pineapple salsa is something that I have not made yet either and it is on the list. I loveeee flat iron steak but the only problem I have is finding the right cut of meat. Now I know which cut t get. That salad looks delish too! A steak that even I would enjoy! The salsa is a great sell for me, love those pineapples.